I recently had the honor of making the wedding cake for my sister-in-law's marriage on June 10. I was thrilled to be able to contribute. 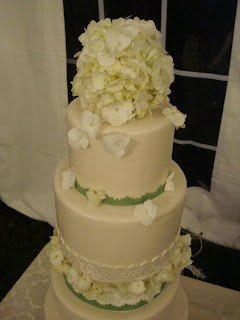 She decided on ivory hydrangeas for her flowers with an overall ivory, white and sage green color scheme. Knowing her personality I knew that she would not want anything ornate. 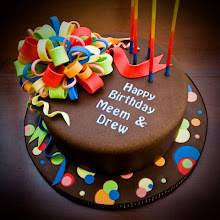 I was extremely happy that my design concept translated so well into the final cake. 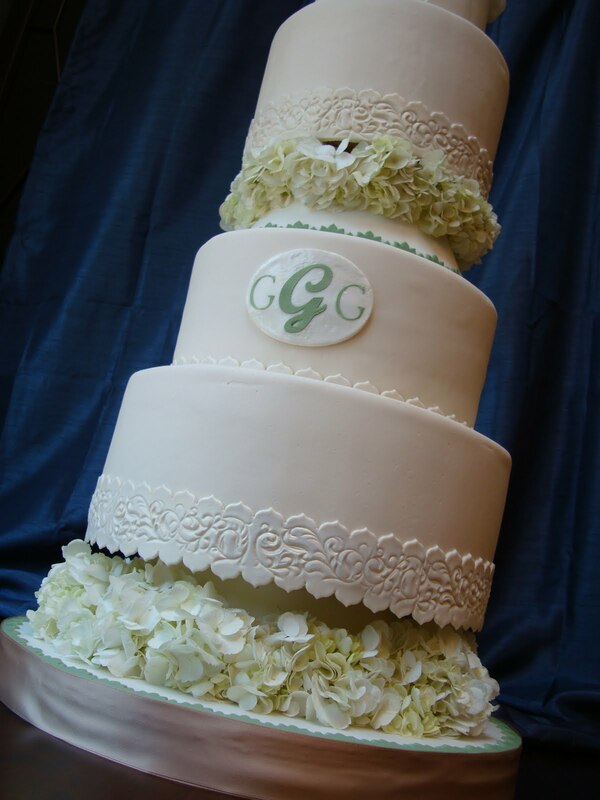 This turned out to be the tallest and heaviest cake I have made to date. It was 4 1/2 feet tall and weighed approx 45 pounds. All 4 tiers were vanilla bean white cake and dark chocolate cake filled with vanilla bean swiss meringue buttercream and chocolate ganache. 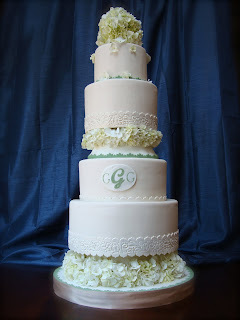 I used Ivory Satin Ice Fondant. The monogram I stenciled with royal icing. 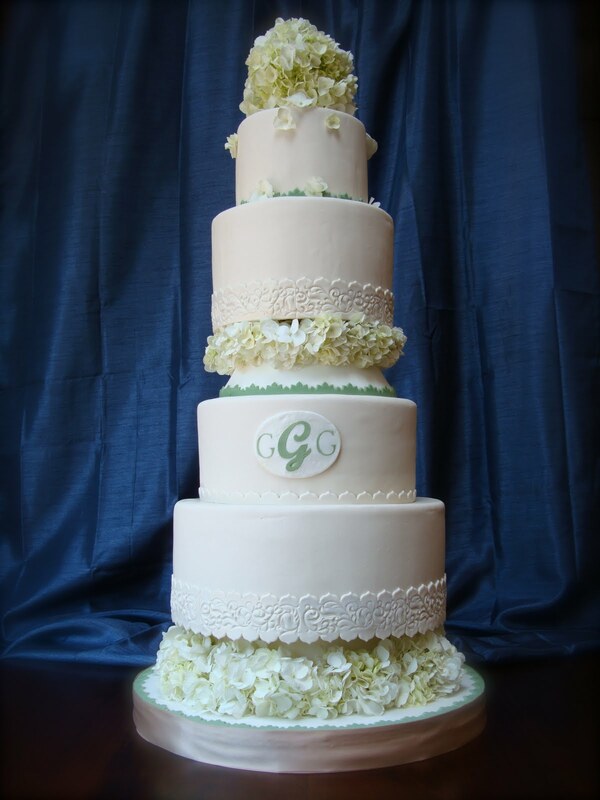 The picture below is the cake set up in the tent. I was a bit nervous about it since it was a very hot and humid evening. But after 3 hours it was still in great shape when they cut into it. If you notice the hydrangea topper in this picture looks different than the one in the blue background picture. Hydrandea wilt very fast once they are snipped from the stem. 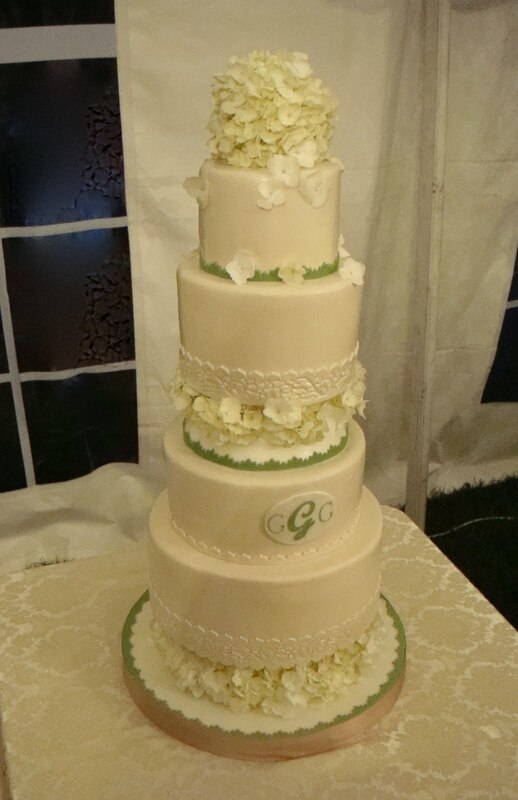 I wound up having to completely replace all the flowers on the cake before I set it up in the tent. I like how the topper turned out better the second time I made it. I'm very happy that I thought to buy lots of extra hydrangea!